My favourite humour author. I honestly laugh out loud at the characters and the funny situations they are put in. I love me some Christopher Moore! What I love about a Moore story are the guaranteed laughs, heaping helpings of insanity, and too many lol moments to count. It always feels like I'm saying goodbye to a close friend when the story is over. This was no different. A Dirty Job is an immersive experience filled with wonderful characters that not only made me smile, cringe, and want to hurl, but also pulled on my heart strings as I frantically turned the pages all the way to the end. Anyway, 5 stars, and two enthusiastic thumbs way up there! Good book, but unnecessarily vulgar. 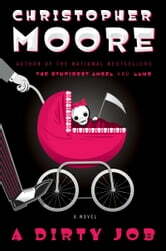 First time I read Christopher Moore. Won’t be the last. Laughed out loud many times. This story was so much fun and delightfully touching. I laughed and giggled my way through Charlie's adventures as death and hilarious efforts at child-wangling.